THE barren land near Cambodian villager Ren Meas’ home used to yield cashew nut and root vegetable crops. Now the vast expanse lies bare and dry, levelled by bulldozers and set to become yet another rubber tree plantation. It is a picture seen across the country as local and foreign corporations are granted land concessions by the Cambodian Government, leading to disputes affecting some 500,000 people. Australians are helping to combat the so-called land grabbing through a program teaching locals to fight back. The five-year, $1.8 million advocacy package is funded by World Vision Australia’s fundraising efforts. 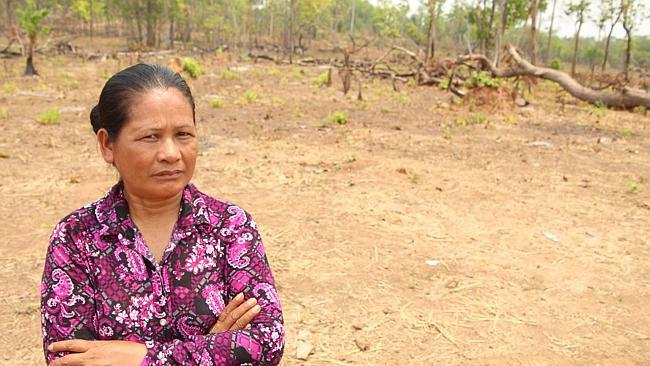 It has taught villagers in Cambodia’s north to challenge land grabbing by seeking media attention, filing complaints with the courts or politicians, attending training sessions and holding public forums. “We work to empower the community for sustainable natural resource management, so people understand that they need to protect this area for their livelihood,” said World Vision Cambodia’s Vanna Bun. However, the villagers are up against large corporations with substantial resources and corruption within government. Disputes have broken out into physical violence and villagers have been threatened. Cambodian Government spokesman Siphan Phay conceded there were “corrupt people” at the local level but argued “most of” the about 700 active land disputes around the country involved villagers moving on to land granted to private companies — not the other way around. One of the key drivers of land disputes is a lack of up to date information about which areas are occupied and by whom. This leads the government to grant land concessions to companies for areas that are already used by villagers for housing or farming. Mr Phay said student volunteers were working with the Government to generate more accurate maps. “If the private companies don’t do what they promised (with the land) … we take it back,” he said. Researchers and advocates report that many companies seek land concessions to clear forested areas, sell the wood and plant rubber trees. Cambodian Prime Minister Hun Sen has identified rubber exports as a driving force for future economic growth but non-government organisations warn the industry is accelerating deforestation, robbing vulnerable locals of their livelihoods and preventing sustainable development. Some villagers in Ren Meas’ community say they have been offered as little as $320 for their parcels of land but argue it is worth up to $19,000 per hectare. They say a French-owned company, Sela Damex, is responsible for the destruction in their province. A Sela Damex representative did not respond to The Advertiser’s request for comment. Despite being threatened for fighting back, Ren Meas says she is not afraid. “If I don’t do it the whole village will collapse,” the 55-year-old mother of one said. “I don’t want to see the powerful people put pressure on the poor. Lauren Novak was in Cambodia for the 2015 International Development Journalism Fellowship.